Sheriff Strada and the Sussex County Sheriff's Crimestopper's Organization will be holding the tth Annual "Race Against Crime" Saturday, September 15, 2018 at 9:30 a.m. to be held at the Sussex County Fairgrounds in Augusta, New Jersey. 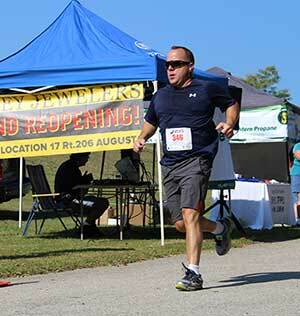 Sussex County Sheriff's Crimestopper's 5K run/walk and 12K run - "Race Against Crime"
Sheriff Strada and the Sussex County Sheriff's Crimestopper's Organization will be holding the 7th Annual "Race Against Crime" Saturday, September 15, 2018 at 9:30 a.m. to be held at the Sussex County Fairgrounds in Augusta, New Jersey. The USATF certified distance of 12K is back again this year beginning and ending at the Sussex County Fairgrounds for runners only. The course offers beautiful views of the Sussex County countryside with lots of water stops provided. The 5K course is completely on Sussex County Fairgrounds property making it very family friends for runners, walkers and strollers alike. Top overall male and female in both events will receive awards and the top 3 in 10 year age groups will be awarded medals. The largest organized team will be receiving an award as well. Loaded goodie bags, a DJ and great community spirit is to be expected. To register, please go to www.runsignup.com or register on race day. Registration fee is $25 if you register before September 1st or $30 September 1st through race day. USATF-NJ Athletes save $3 if received by September 10th. For additional information, please contact Hilary Manser at 973-579-0850 ext 2114. Thank you to our presenting sponsor, Thorlabs as well as our other participating sponsors. Sussex County Sheriff's Crimstoppers receive tips and pays rewards up to $1,000 for information leading to the arrest and indictment of criminals. All tips are handled anonymously through an assigned confidential code number. You will not be asked for your name. The Sussex County Sheriff's Crime Stoppers is a 501(c)(3) organization funded by contributions from local businesses and individuals at no cost to the taxpayer. The program is administered by a volunteer civilian board of commissioners which oversees routine business affairs, controls finances, and determines reward amounts and methods of payment.